In this lovely, unconventional, and often funny memoir, Catherine Goldhammer wakes in middle age to find herself stunned, newly separated, and several tax brackets poorer, forced by circumstance to move from the affluent New England suburb of her daughter’s childhood into a new, more rustic life by the sea. Against all logic, partly to please her daughter and partly for reasons not clear to her at the time, she begins this yars of transition by purchasing six baby chickens—whose job, she comes to suspect, is to pull her and her daughter forward, out of one life and into another. As she gradually transforms her new home—with its tawdry exterior but radiant soul—tile by tile, flower bed by flower bed; as she watches her precocious twelve-year-old daughter blossom into a stylish and sophisticated teenager; and has she tends to the needs of six enigmatic chickens, we accompany the author as her life slowly shifts from chaos to grace. 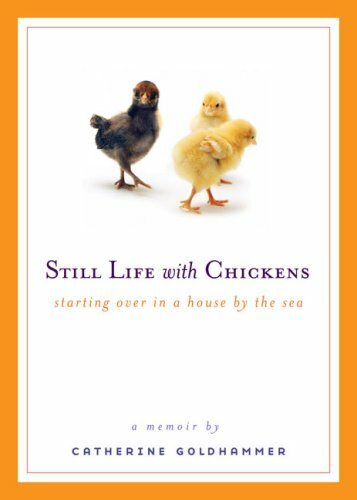 Still Life with Chickens is an unforgettable lesson in hope, in starting over, and in the transcendent wisdom that can often be found in the most unlikely of places. Catherine Goldhammer is a graduate of Goddard College and was a poetry fellow in the master of fine arts program at the University of Massachusetts in Amherst. Her poetry has been published in the Georgia Review and the Ohio Review, and by Innerer Klang Press. Ms. Goldhammer has worked as a writer, trainer, and reading teacher. She lives in a small cottage on the coast of New England with her daughter, her dog, a cat named Monkey, and a small flock of chickens. Why do you think the author agrees to buy the chickens? What finally makes her give in? What do the chickens represent to her and why are the essential to her new life? Discuss the differences between the town the author calls Hearts-are-Cold and the neighborhood she moves to. Why do you think she is more comfortable in her new surroundings? What about the new neighborhood appeals to her? Why? The author’s daughter is a major player within the memoir. Discuss how she changes and grows during this transition in their lives. How does she influence her mother? Why is she a source of such awe? Who in your own life plays that role? Of all the houses the author sees, why do you think she chooses the one she does? What is she looking for? What does she find? What is the role of the “Moon Women”? How do they contribute to the author’s ability to move on with her life? When the author and her daughter are established in their new home, the author writes, “So what was is about chickens that made me want to set up my lawn chair out there by the chicken yard, sit down with a glass of lemonade, and watch? They are simple” (168). Why about the simplicity of the chickens is so attractive? Do you think the chickens are simple? In what ways are they simple and in what ways are they difficult for the author and her daughter? Throughout the memoir, the author remarks numerous times that her house was made possible because others were kind to her. What are some examples of the kindness in the people she met throughout the process? How did they help her? What roles did they play in building the house and helping her start her life over? In what ways does the author change during the renovation process? What literal and emotional changes occur? Do you feel that she has grown and changed by the end of the memoir? How? Discuss the Alice’s Adventures in Wonderland quote at the beginning of the book. Why did the author choose it? How does it relate to her own story? Do you think that she has accomplished impossible things?